Remember the Samsung Galaxy S II review ? We took a good look at some rather excellent Gameloft games and were mightily impressed. Now Sony Ericsson are teaming up with Gameloft to launch Rainbow Six – Shadow Vanguard exclusively on the Xperia PLAY. 20 other games have been announced including 10 exclusive titles which will be optimised for the PLAY. The games which will be exclusive to the handset include Minecraft, Battlefield Bad Company 2, Desert Winds, Icebreaker and Armageddon Squadron 2. Other games include Eternal Legacy, Pocket Legends, Guns ‘n Glory, Happy Vikings, Pocket RPG and many more. Get the full press release below and video or checkout our earlier film showing some of the Gameloft productions below..
Atlanta, GA – June 2, 2011 – Today Sony Ericsson announces more than 20 new games, including 10 exclusive titles, optimized for Xperia™ PLAY. The new games, many of which will be showcased at the world’s leading games expo, E3, June 7-9, add to the more than 60 titles already available for Xperia™ PLAY. The new titles offer broad appeal to different users and usage occasions from popular, innovative, massively multi-player online titles (MMO) to immersive titles and addictive graphically rich new casual content. Amongst the titles announced today is Minecraft™, the much anticipated game from the Swedish indie developer Mojang, currently setting the industry alight. Minecraft™ is one of the fastest growing game franchises in history, with over eight million registered users announced to date and over 50,000 new players joining every day. 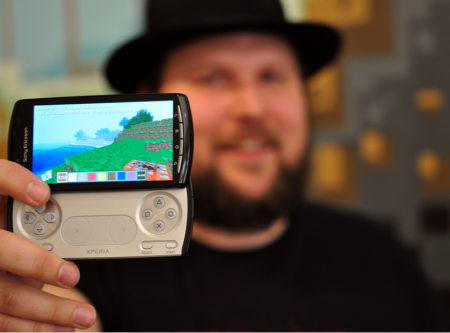 In addition to the new titles announced today, Sony Ericsson can confirm that new games from Sony Computer Entertainment’s stable of classic PlayStation 1 titles will be coming to Xperia™ PLAY shortly. More details will be shared imminently. Sony Ericsson’s support for the Android ecosystem also includes its partnerships with key industry players, such as Unity and Havok, with whom it is working to build an ever growing ecosystem. Sony Ericsson is launching a programme to support and find new upcoming innovative developers called “Stand out from the crowd”, which enables game developers to become part of the Xperia™ PLAY story and get their games the profile they need. Sony Ericsson will be present at E3 in Los Angeles, June 7-9, to offer first hands-on demos of Xperia™ PLAY and many of the new games in the Sony Ericsson booth 713. The new games announced today will be released in the coming months. More details regarding timing and exclusivity will be announced during E3 week and closer to launch.